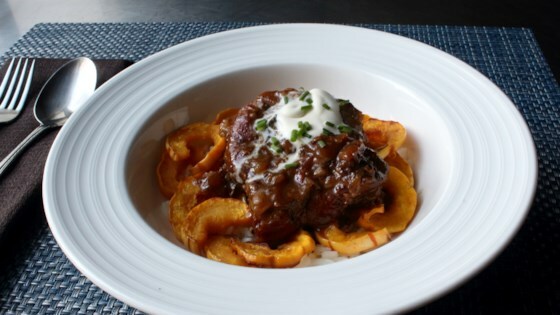 "Chunks of pork shoulder cook low and slow in an apple cider sauce until perfectly tender and sauce has thickened. This is delicious served over spätzle or buttered rice." Generously salt all sides of the pork shoulder chunks. Heat oil in a heavy pot over high heat. Brown pork shoulder pieces until surface is seared and crusty, about 3 or 4 minutes per side. Transfer browned pork to a plate. Add onions to oil and reduce heat to medium and season with a pinch of salt and pepper. Cook and stir about 2 minutes. Add torn sage leaves; cook until onions soften and begin to brown, stirring frequently. Pour cider into pot; stir to deglaze bottom. Raise heat to high and bring to a boil. Stir in cider vinegar. Reduce heat to low. Raise heat to high and bring sauce to a simmer. Whisk in creme fraiche. Simmer until liquid is reduced by half and is slightly thickened, 8 to 10 minutes. Stir in a pinch of cayenne. Transfer pork back to pot; reduce heat to low. Baste pork with sauce while it heats through and becomes perfectly tender, and the sauce is as thick as you want it, about 15 more minutes. Chef John's tip: use hard apple cider to braise your pork! You can substitute non-alcoholic apple cider or apple juice for the hard apple cider. But hard cider works best. Easy and tasty for a wintry afternoon.